What does Product Owner do in Scrum? The role called Product Owner meets this scrum essence. 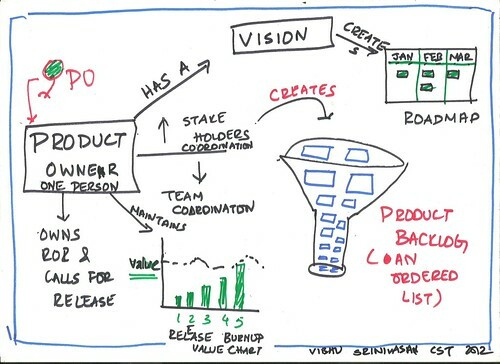 The product owner with his or her vision works with all the stakeholders , other business groups and creates a product road map for the product. They also answer all the questions teams have with regards to the requirements of the product. At the end of the sprint when the team shows a potential shippable product increment, the PO accepts the product and gives feedback. Most of their time is spent in writing the product backlog and breaking big requirements into smaller items as shown by the funnel in the picture. The product owner as they break down requirements order the product backlog in terms of business value, risk, technical input from teams. Product owner in scrum is one person, not a group or committee. This way of breaking down product backlog items from big to small items is called Progressive elaboration. They also keep maintain the release burn-up chart.